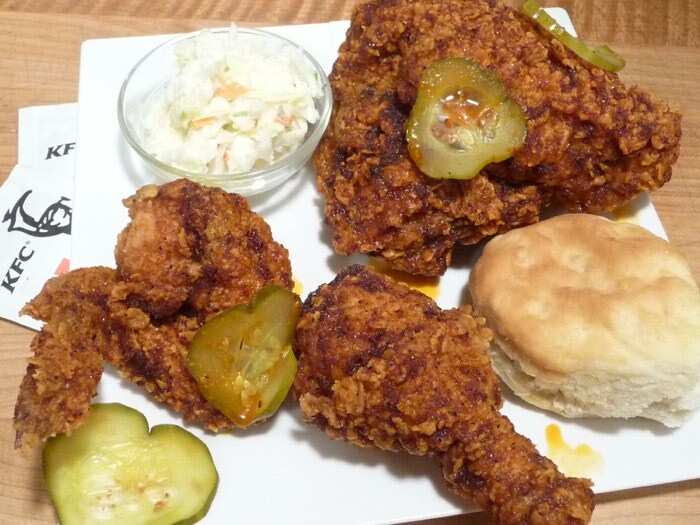 Nashville Hot Chicken has been on our radar for a while now, and we considered recreating the recipe to try at home, but KFC has taken care of it for us. Thank you Colonel Sanders Inc. While not exactly “hot wings”, we’re including this unique chicken in our Week of Wings 7 – Day 4. 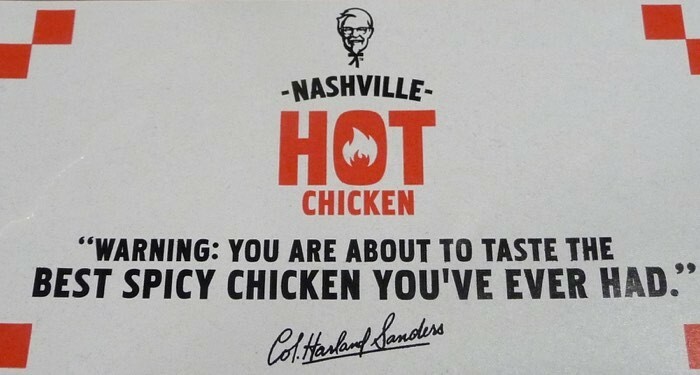 It’s a shame KFC doesn’t offer their Nashville Hot Chicken in a “wing only” version. We don’t often post about fast foods – our friend “Q” over at BrandEating.com does an awesome job of those reviews – but we just had to share this with our readers. 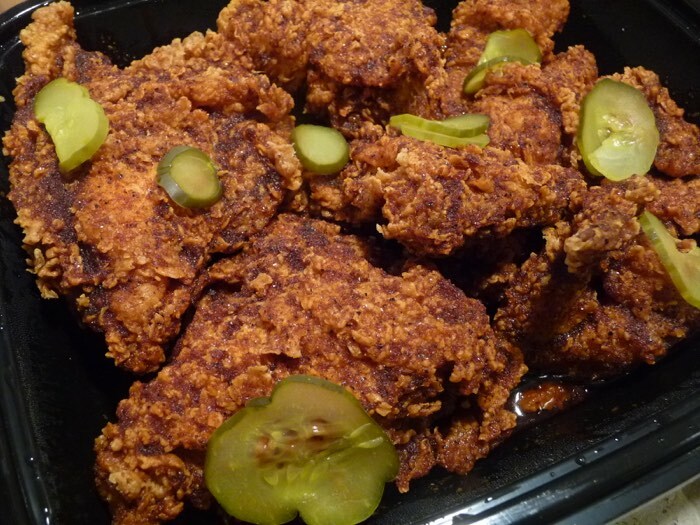 Quick backstory about the recipe: Nashville Hot Chicken originated in the 1930’s at Prince’s Hot Chicken Shack in Nashville, Tennessee. See, it’s right there on the sticker. We’ll keep this short and sweet spicy. This is some of the best spicy chicken we’ve ever had. Without a doubt. Bar none. Period. Ok, you get the idea. We like it. Remarkably, KFC’s original Extra Crispy Chicken stays… well, extra crispy – even after being doused with the spicy oil. It must be science! We purchased the 8 piece Family Meal, that included 2 breasts, 2 thighs, 2 legs, and 2 wings – along with 2 sides. Heat Level: – Very spicy! Hot. Overall Flavor: – Best spicy chicken we’ve had from a fast food joint. Unique and savory! Enjoy with KFC’s really decent cole slaw and a good cola. Oh, and biscuits. KFC also offers Nashville Hot Tenders that sport the same spicy sauce drizzled over their crispy chicken tenders. Seriously, we think this offering trumps the best of what Popeye’s has ever offered. Go get some now. Then come back and tell us what you think. We’ll wait. I will have to check that one out. Thanks Brian. I enjoyed the chicken pieces much more than the tenders. Must be the bone-in flavor that makes them taste better. Thanks for the review, I happened to try the hot chicken last night, and it was pretty good. I wouldn’t say it’s super-good in absolute terms, but it’s definitely the best thing you can get from KFC. Very tasty. I made a special trip to KFC just to try it, and I’m glad I did. I hope it stays on the menu permanently. I thought the presentation would be improved if they had chosen a plastic container other than black, so the redness of the sauce would be a treat for the eyes. I’ve never had Popeye’s, strangely, I shoudl check them out too. I also find it strange that KFC doesn’t do wings — what happens to the wings from all those chickens they serve? You make some good points, RR. I agree a white tray would show of the color better, but the black tray says “Hot” better. Heat level is subjective. I think mine was doused fairly heavily, and the amount of chili powder and other seasonings squirted onto the chicken depends on how vigorously the server shakes up the squirt bottle. Last time I was at KFC, I complained that they don’t offer wings as an option. Sure, you can buy a single wing, but at $1.69 each, it’s not practical. KFC’s Nashville Hot Chicken has a nice kick but it’s not super spicy, so I’d also give it a 2 1/2. My area’s Popyeye’s in Kentucky can be pretty spicy at times but they’re not consistent. Sometimes it’s super spicy while other times I can barely taste it. Thanks, Delilah, I’m glad you said “nice kick”… at least you like it. Our Popeye’s is the same way – I guess most fast food chains are inconsistent, considering that it’s mostly kids that work at them. I should probably be shot since I got to Nashville 12 times a year for the past 15 years and have never had Nashville hot chicken. I know, right? Yup, that’s just kooky talk! I work at KFC in Chattanooga and we do offer wings. You can substitute the breast, leg, or thing for a wing, although you will not get as much chicken with a wing it is a great thing to get when you are just trying it or if you just want a couple of bites. 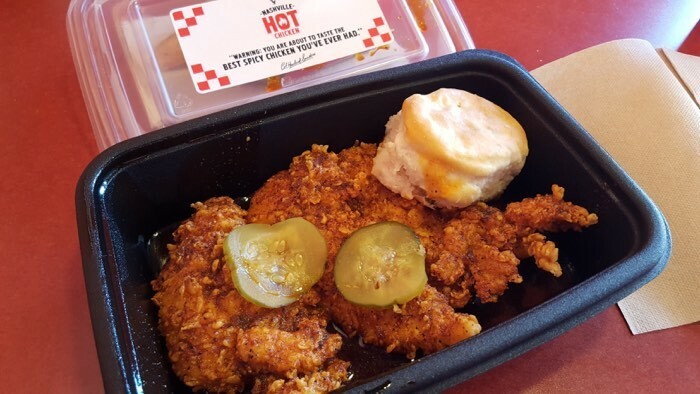 All of the chicken in our Nashville hot can be substituted for a different piece as long as it is the extra crispy, also the cole slaw can be substituted for a side of your choice and if you do not want the biscuit in the same container tell them and they will put it in a box of its own, same with the pickles. Thanks, Marie. I’ve heard that the employees really have to shake that sauce very well. Good tip about the wings too! 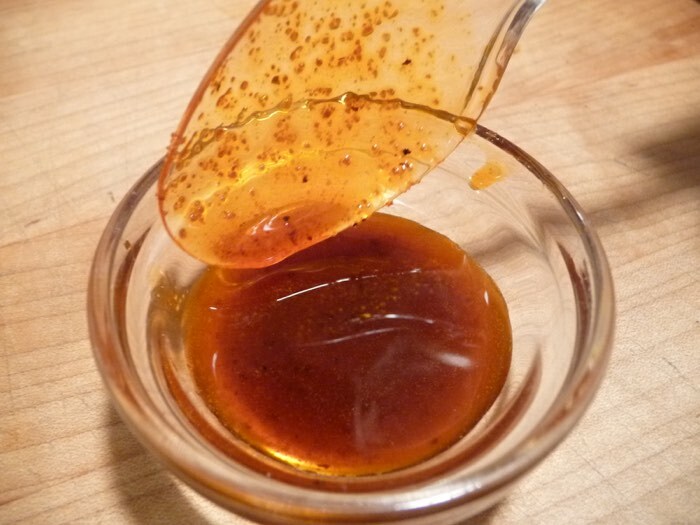 Oh, I want to make the sauce — it is so good spooned over beans and rice and more. Please, could you do a sauce recipe?